This Is a Marathon. A Cosplay Marathon. The next Tokyo Marathon takes place in late February. Last fall it was named one of the six World Marathon Majors, joining the likes of New York, Boston, London, and more. But, the Tokyo Marathon is just filled with your typical marathon runners. There are also a noticeable group of cosplay runners dressed up as anime and video game characters. Oh, and Jesus. Website Tofugu did a round-up of the cosplaying marathon runners, featuring the photos of photographer Jim Gris. 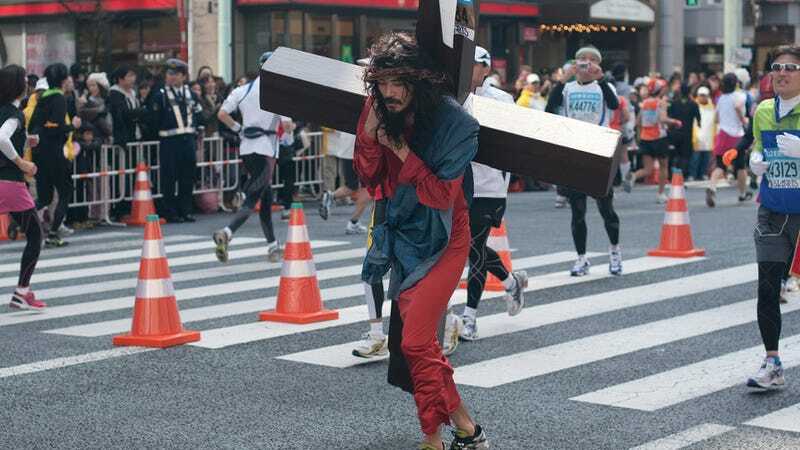 The Jesus marathon cosplay made a big splash when it first hit a few years back. Have a look in the above gallery for more costumed runners, or check out Gris' Flickr page.